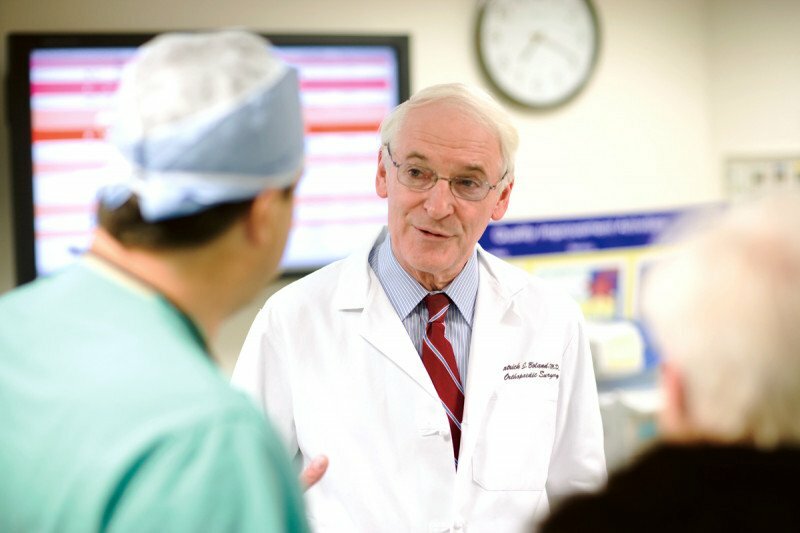 Compassionate Care -- Memorial Sloan Kettering's bone cancer disease management team consists of specialists such as Patrick Boland, an orthopaedic surgeon. Primary bone cancer, which begins in the bone itself (rather than spreading from another part of the body), is quite rare. It can grow in any of the bones in the body. Certain types emerge most often in the long bones of the arms and legs, while others occur most often in the pelvis, legs, ribs, and spine. It occurs most often in children and young adults, although it can affect people at any age. Bone cancer forms in the cells that make hard bone tissue. Cancers that start in the bone marrow are not considered bone cancers. (These include leukemia, multiple myeloma, and lymphoma.) They do affect the bone, however, and may require treatment by bone specialists. Benign (noncancerous) bone tumors are more common than malignant (cancerous) ones. Benign tumors do not spread and are rarely life threatening. But both types may grow and compress healthy bone tissue and absorb or replace it with abnormal tissue. This information is about primary bone cancer in adults. Learn about osteosarcoma, a type of bone cancer that mostly affects children and teens. Metastatic bone cancer — cancer that starts somewhere else in the body and then spreads to the bone — is much more common than primary bone cancer. Although any type of cancer can spread to the bone, the most common are breast, lung, kidney, thyroid, and prostate cancer. Bone metastases most often arise in the hip, femur (thigh bone), shoulder, and spine. Treatment for primary bone cancer can include surgery, chemotherapy, and radiation therapy. These can be used either alone or in combination with each other. Surgery is often the main treatment for bone cancer. Our surgeons focus on preserving the form and function of the bones as much as possible while providing you with the best chance for cure or long-term control of the disease. In some cases, you may have chemotherapy and/or radiation therapy before surgery to help shrink the tumor and make it easier to remove. For certain bone tumors, such as Ewing sarcoma, you may not need surgery when chemotherapy and radiation are used. Our multidisciplinary bone cancer team works together to determine the best course of treatment for you based on the location of your tumor and your overall health. You may also have the opportunity to participate in clinical trials evaluating new therapies or surgical and radiation techniques that are not yet widely available. The most common symptom of bone cancer is pain, which is caused by either the spread of the tumor or the breaking of bone that is weakened by a tumor. You also may feel stiffness or tenderness in the bone. Sometimes there are other symptoms — such as fatigue, fever, swelling, and stumbling — but these can also be caused by other conditions. Only a doctor can tell for sure whether or not you have bone cancer.